What is a Canada Passport? Prior to June of 2009, citizens of the United States were able to cross the Canadian border without the need to produce a passport. 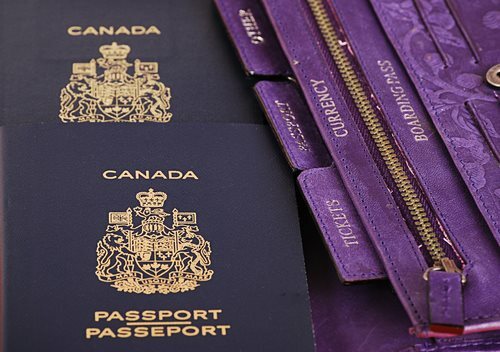 However, as a result, of globalization, the increased protection to the United States’ borders, and terrorist threats, every citizen of the world is required to produce a passport in order to enter Canada. As a result of these rule changes, the Canadian Passport represents the formal document that grants legal entry into the country of Canada. Without the acquisition of a Canada passport, an individual will be impeded form entering Canada, regardless of their country of origin. Although the barriers for entry into Canada have become more stringent, citizens of the United States are permitted to enter the country with a Canada Passport Card. This document may be used in lieu of a Canada Passport Book; however, both documents are valid for entry. The Canada passport cards allow individuals to be granted entry into both Mexico and Canada. The following characteristics and forms must be satisfied to obtain a Canada Passport Card. The passport card is a formal document that is used to legally enter Mexico or Canada. The following intricacies must be satisfied in order to obtain a Passport Card. A fee of $55 is required for first time, adult applicants. All minor applicants (those individuals under the age of 18 years old) will be required to pay $40. Adult renewal applicants will be required to pay $30. In the event of a lost passport, Form DS-64 must be submitted. The applicant must submit an original and valid birth certificate or a similar government-issued identification. The applicant must also include their valid social security number. The applicant must submit a color photograph that meets the requirements expressed by the Passport Office. The photo must be 2 inches by 2 inches in measurement and taken within 6 months prior to the filing of the application. The Canada Passport card is valid for 10 years for adult recipients and 5 years for minor recipients. Upon expiration, the applicant must renew their Canada Passport for permission to enter the country. The Canada Passport Book is used by Canadian citizens to enter any nation in the world. The following specifics must be satisfied to legally obtain a Canada Passport Book. An applicant must pay a $75 fee, as well as an additional processing fee of $25 to receive a Canada Passport Book. If the individual would like to receive the passport book in an expedited fashion, the applicant must pay an additional $60 surcharge. Form DS-64 must be filed in case of a lost passport. The Canada Passport Book is valid for 10 years for adult recipients and 5 years for minor recipients. 1. If an applicant has trouble obtaining a Canada Passport it is suggested that the individual seek the aid of an Immigration Attorney. These legal professionals can be instrumental throughout the application and approval process with regard to a Canada Passport. 2. An immigration attorney is well-versed in immigration legislation, form requirements, stipulations, and conditions applicable to the attainment of approval for the expressed permission of legal entry. These legal professional will advise their respective client(s) by arranging paperwork, investigating immigration status, and ensure the legality of all immigration-based activity and requests.